In this tutorial i will be demonstrating how to build simple android ListView. This article is about creating listview and launching new activity on selecting single list item. 1. Create a new project by going to File ⇒ New Android Project. Fill all the details and name your activity as AndroidListViewActivity. 2. Once the project is created open your main activity java file (in this case AndroidListViewActivity.java) and extend the class from ListActivity. 3. Now we need a string resources file to store all list item labels. So create an XML file under values folder and name it as list_data.xml and paste the following code. 4. In ListView each list item will be an xml layout, so we can customize each list item. Create an XML file under res/layout folder and name it as list_item.xml and type the following code. This xml layout will be single list item row. 5. Now open your main activity java file (AndroidListViewActivity.java) and type the following code. In the following code i am importing all xml resources data and storing them in an Array. On the next step i am binding array to ListAdapter. 6. Now run your project you can see listview with list of array items. But on clicking single list item you can see no action. So we need to start new activity on selecting single list item. In my previous article i had explained how to switch between screens. Here i am going to show single list item details in new screen. 8. 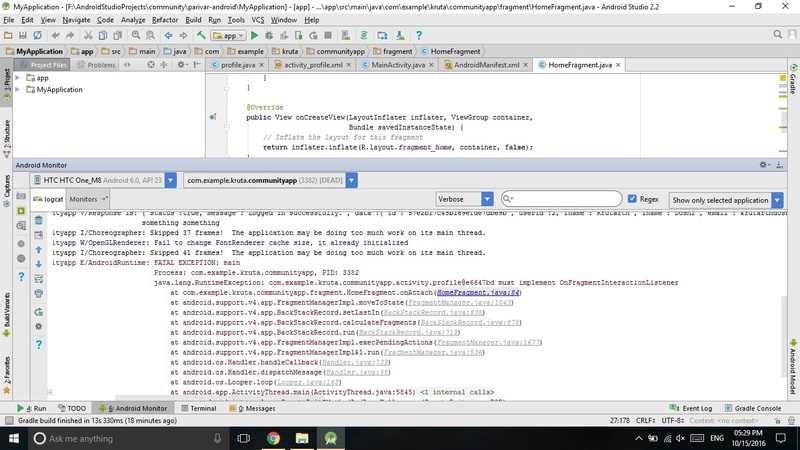 Open your AndroidListViewActivity.java and modify the code to following. In the following code i am getting the selected list item string(product name) and sending it to new Activity. Now in new activity we need to display the received from listview activity. 10. Now open your second activity file i.e SingleListItem.java and paste the following code. 12. Finally run your project by right clicking on your project folder ⇒ Run As ⇒ 1 Android Application. * In this case, is an Activity object that you must send to the Intent constructor. By doing this, you are telling your Intent object that you want to open the ActivityToCall activity when clicking on an item. As far as I know (1 year dusty knowledge), the answer is no. I am sorry but you will have to search around to see if this changed or not. The app lunches okay, however, it crashes when I select one of the rows. hey did you got d ansr bcs i am working on somthing same and i am facing the same problem pls help me..
hey I have similar problm wat mia have so pls help me out with this. i am using tab host..and in the last tab, i want to display a simple lisIt view filled from array string in values,not database..so i did the first part of your tutorial which doesn’t do the work for me..and I don’t know why. the code is simple, and i don’t believe I made any mistakes. Do you maybe know if there is something special that I need to do because it’s tab host. Hello George. What kind of app you want to develop? I also need help developing an app. I am new to java and I need to create a Listview which holds some amount of data. I did try create one for myself for it always crash. I think I am doing something wrong. So if you think you can help pls get in touch and we can talk more. Great tutorial. I´ve created a github repo with the code. It may be useful to someone: https://github.com/joaquindev/android-listview.git Keep up the good work! but how can i show scroll-able text after selecting an item from above list. if i select “Adobe Edge” then a new screen should show me “It is a product of Adobe Company developed by…, , etc, etc,…..”. for doing this i can’t make new activity, because doing so will increase my .class files, and it is not a good programming practice in i have 50 items in a listview. So please suggest me the way with code, thank you. While we extending Activity class in our coding and another side we extends arrayadapter class than how we get selected item from Listview? If I want to add a subtext under the text, how should i add it? hello ravi, this tutorial is work in my eclipse and i want to add a picture when i choose one of the list. can you tell me how it? i’m sorry if my english so bad. How do I display simple action bar (having a textview) on List view page?? Hi , Thanks for awesome tutorial…..
At the bottom of your post you have attached two image files. In the first image file, “adobe fireworks” is highlighted. Do you know how I can change the color for my lisview item onClick to orange and then when user takes their finger off screen it goes back to default black colour? You can create a new folder with the name ‘drawable’ and add the xml files. Use the gradient_bg.xml, gradient_bg_hover.xml, list_selector.xml files from below tutorial. Thank you very much….Can I please double check with you that the “drawable” folder most online tutorials speak about creating is to created under the “res” directory where the other drawable folders are?? pls kindly clarify for me…. Thank you for the link to tutorial. My mp3 files are stores on SQL server database where I have stored the web links to the mp3. Thanks alot, i appreciate your time and am grateful for your response. Yeah, drawable folder used to create under res folder when a new project is created when using older build tools(May be you are reading the articles written in those days). Now in recent build tools this folder is not creating by default. We have to create it manually whenever required. How do I alter the code to add details of each product, for display on the second screen? It is already there in the tutorial in 8th point. Stage 8 shows how to put 1 piece of info on the second screen, but I was wondering about putting a review, and maybe a picture, as well as the title. Then you can create a model class which contains object of your listview item. Ex: Movie class with title, picture. Implement this model class from Serializable. When you launch the intent pass this model class in putExtra method. I have a very long list, how can i make it so that the list will only update when i scrolled till the end? I want have the list only appear when i type something in the search box,how would you do this? Thanks a lot.this is very useful! Hi Ravi, Thank you for your tutorials they are really helpfull….i have created a basic listview app….all coding is done….but when i try to run the app its showing error ” app has stopped working”. Dear Sir, Thank you Great help. @ravi8x:disqus : Thank you for the tutorial….I would like to add the background image to the listview. Hello, it will be great help if you can do tutorial on list view populating data from sqlite database thanks. You can follow the below tutorial and replace the spinner with list view. And what about Adapter which adapter i should use to set on listview because i don’t think so arrayadapter will work with database. You need to use a custom adapter, fetch the data from database and attach to it. Also use RecyclerView instead of ListView. Thank you buddy 🙂 and your tutorials are awesome great work keep it up. i use this site to make a search engine ! but when activity start , occur Force Close. Thank you so much for the Tutorial, Mr.Ravi. It’s really helpful ! how to put search engine in your code? Thank u ,but how to make every item open a text view. Hello sir,Thx for this great tutorial.I’m a beginner in android development. I have one que. sir,when i click on any item its showing only item name.What should i do if i want to show some text,paragraphs and images in specific item like Adobe After Effects. hi rav. very nice tutorial. But please how do i make each item e.g adobe to launch a new activitys very very i when clicked? please it is very very urgent. thanks a lot sir. Hi Ravi. This is a amazing turtorial. Well done. Its very helpfull. I have one question. After copy paste and test this project its missing from my device the text on top “Android List view”. Why is that happening? Is something missing from the codes? any one can help me please. i want to make list items clickable .but it doesn’t work. how to create a seperate screen for every list item…..??? Please where can i find a tutorial on how to convert a wordpress website into an andriod app.. i don’t want to use appresser they are very expensive. A-o-A everyone .,.,My question is “I want to create Listview with Image and text ,,but this tutorial is only for textview.please help me “? single_list_item_view.xml cannot easily edit. can u help me? sir, I just want to start a new activity instead of sending the data to next page? can you help me out? Admin why every code of ours does not run in android studio. but if i try to follow the guide, in the mainactivity there is a java file R.java and u dont mention it in the guide? anyone can help me? R.java file will be generated each time you build the project. No need to worry about it. Hi Ravi. based on this tutorial, can u show how to display two text in one column listview? my intent is not working .I have created a new android activity. Is it necessary to declare in manifest file. 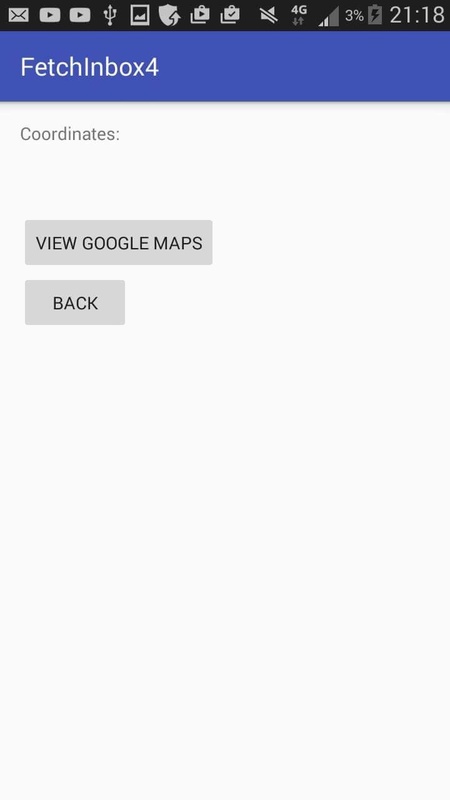 You need to follow the ListView alternative RecyclerView which was introduced in material design. You can launch new activity by using Intent in listview / recyclerview click listeners. Tell me what do you need. https://uploads.disquscdn.com/images/ca0bcba0fa9f6f30f851092cf6f23f8a12cb94667dfe9c9f60a2857fd8ba0532.jpg Hello Mr. Ravi I am getting the error as shown in photo.. What should I do? Remove onAttach() method from your fragment. hello does this only work for eclipse? or can i use android studio to do the codings too? Hi Marija, yes you can also use in Android Studio. Hello thank you so much for the speedy reply. My listview is actually a refreshing one as it’s synced to the phone’s inbox. So everytime a new message comes, the listview gets updated. Do you by any chance know how to go about this? Cuz for this example, its a fixed listview. So im not sure how to store the contents of my listview. mListAdapter.notifyDataSetChanged(); //It Updated your list. Second : Updating List Adapter. Finally iam week in communication, please forgive me. Hello I actually already made it work the part about syncing my inbox to the listview of the app. Now my problem is how do store the contents of my listview in the xml (step no. 3). Im so sorrr if I have a lot of qns. I am quite new to android studio and this is for my final year project in school. Im kind of in a rush to finish this project as I have a deadline soon. Thank you so much for your help though, I really appreciate it. Two options you can store messages in sqlite database, or you can write XML data to texfile and store. Yeah i heard that i need to use sqlite database. The thing is this android studio is my plan B cuz my plan a didnt work. My supervisor asked me to change and learn android studio and develop this app in such a short time. Ive been learning and trying my luck with forums and video tutorials and so far ive managed to do it but for this part im stuck. My deadline is this jan 5 and im nowhere near to finishing my app. Androis studio is very new to me and im not very good at my programming. OK then tell me u need help for textfile or SQL database. OK then send me wt r the fields u need in database I will send u the code that’s very simple. Any more database fields required. OK I will send u the code. Wait for 2hrs iam out now, I will get back to work. r u there how can i send you the java files, can u send me ur mail id. Ok then, i am uploading the source code to my server you can download from it, and follow the instructions. click the above link to download the source code. 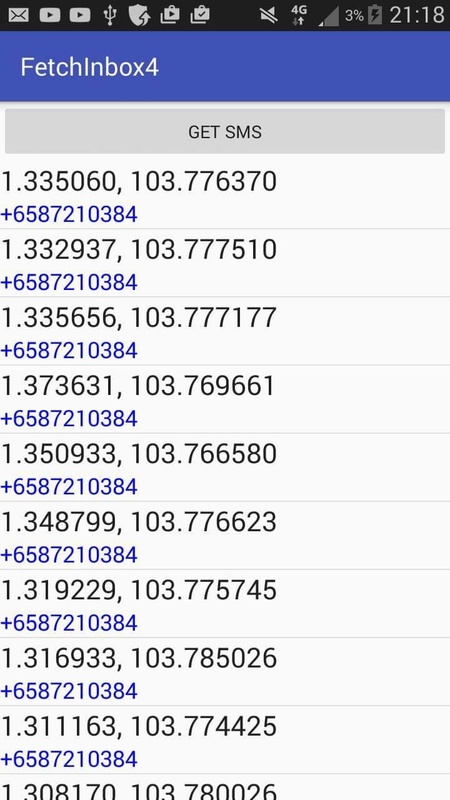 Hello these codes will help to store the coordinates inside the database and pass it to the next activity and display it there right? Hello , I am Use This code , But I am Use List view In The Place Of Text View . I am Not Getting Result . I have Got a Proble Please Share me the Problem Solution. plzz do reply its urgent!!!!! Hi, i have 2 listview in same activity. i want to change 2nd listview item as per 1st listview value. How to add each item, in a new ListView, something like list of favorites? how to dynamically creates the section headers over the list item, in list view? Is there a way like this that uses mysql database?